A quick fix recipe to get your family out the door. 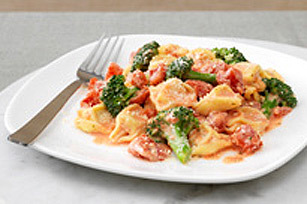 Cook pasta as directed on package, adding broccoli to the boiling water for the last 3 min. of the pasta cooking time. Meanwhile, cook tomatoes in large skillet on medium heat 5 min. Add cream cheese product; cook 2 to 3 min. or until cream cheese is completely melted and mixture is well blended, stirring frequently. Drain pasta mixture. Add to tomato mixture in skillet; mix lightly. Sprinkle with Parmesan cheese. Substitute your favourite frozen vegetable blend for the broccoli.